Indie Retro News: Lunar Jetman Remake - ZX Spectrum original as a fantastic PC overhaul! Lunar Jetman Remake - ZX Spectrum original as a fantastic PC overhaul! We were recently contacted by Havard Spring that the faithful PC remake of the hit ZX Spectrum classic "Lunar Jetman", has been re-hosted on his website for all to enjoy. First developed by Ultimate Play The Game in 1983 and the second in the Jetman series, this was one of the most highly regarded classics of its time as you play as Jetman to locate and destroy (with the bomb) a series of alien bases on the surface of the moon. Now thanks to Havard, you will be able to experience one of the better remakes that was coded by Bastich, graphics by Invent and music by Deathboy. 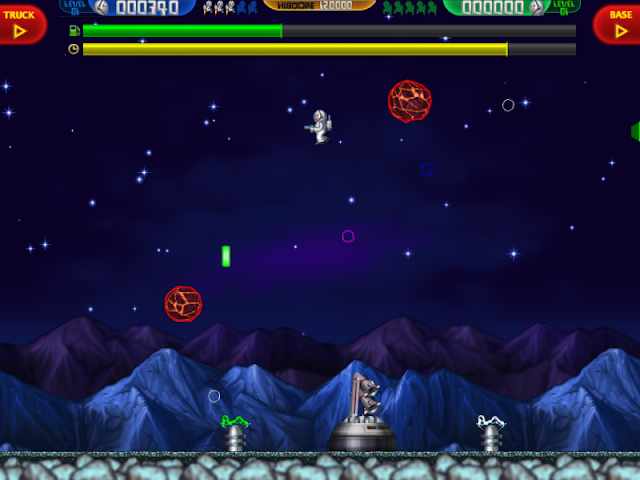 Lunar Jetman Remake was announced by us way back in 2015, but sadly this game that was remade in all its HD 1080p graphical glory with smooth parallax scrolling and 1 or 2 players couldn't be downloaded as the links were dead and the website non existent. So now thanks to the website owner, you can now replay the game if you missed it all those years ago.